We’re holding our Westminster lobby of MPs on Tuesday 31st January in Room R, Portcullis House, Westminster. If you’re able to make it, we looking forward to seeing you there! 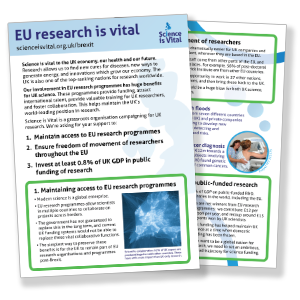 Whether you can make it or not, you might like to read more about the research community’s concerns around Brexit, including a two-page briefing we’ve produced for the lobby. There’s also still time to contact your MP and ask them to attend! Below are a few details of what you need to do, and to expect on the day. If you’ve got any questions, please let us know: you can leave a comment below, or tweet us at @ScienceIsVital. As MPs have busy Westminster schedules, we’re keeping the lobby a relatively informal ‘drop-in’ session, so they can arrive any time between 2pm and 4pm. If you can, we’d strongly encourage you to contact your MP’s office before the day of the lobby to double check that they’ll be able to attend (ideally at a pre-arranged time). The best way to do this is via telephone: call the House of Commons switchboard on 020 7219 3000, and ask to be put through to your MP’s office (mentioning that you’re one of their constituents). Tuesday 31st will also be the day of the debate in the House of Commons concerning the triggering of Article 50. This will start around 2pm (depending upon other business), and MPs may want to be in the debating chamber. This makes it doubly worthwhile to call your MP’s office today and double-check that they’re able to make it and, if so, when. If the timing of the debate means they can’t make our lobby slot, then you could suggest meeting them separately beforehand – we’ll be onsite near Central Lobby from 11.30am onwards. Central Lobby is available for constituents to talk directly to their MPs, and it doesn’t require a parliamentary pass. If you can’t find us, call us on 07779 791013, or check our Twitter feed for updates. Even if your MP is not attending, you are still very welcome to come along yourself, and meet with other Science is Vital campaigners. The lobby will take place in Room R at Portcullis House, which has been booked from 2pm to 4pm by Carol Monaghan MP. A map showing the entrance to Portcullis House can be downloaded here. There is airport-style security at the Houses of Parliament, so entry into Portcullis House may take up to 15 minutes. Once you’ve entered, ask to be directed to Room R.
Thank your MP for seeing you and establish how much time you have. Make two or three key points. We’ve produced a briefing note (PDF) on what we think are the headline issues (we’ll have paper copies of these for you to give to your MP on the day), and there’s more information on the key arguments on our Brexit policy page. If you have direct experience which may be helpful in adding weight to the arguments, use it! Don’t assume that your MP is not on your side – their party might be in Government, but you never know what the individual MP will say. Put your case to them and give them a chance to do the same. Always give the MP something to take away – that’s what our briefing note is for! Make a note of their response and feed this back to Science is Vital. Make sure you ask them to take action. This might, for example, include raising your concerns with relevant government ministers (David Davis, Jo Johnson, Robin Walker), or in the debate on the triggering of Article 50. You want to know they are showing you support.